Being educated in his native Brazil and also abroad, Aziz feels it is a social responsibility to contribute to making the world a better place by helping people acquire practical skills in law and by demonstrating the importance of the rule of law. As a law professor and former dean, he has taken on many pro bono cases for those who could not afford an attorney. 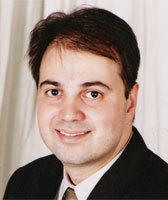 After graduating from law school in Brazil, Aziz was awarded a Fulbright scholarship and pursued a Master of Laws degree at the University of Arizona. He then returned to Brazil and obtained a PhD in law at the Federal University of Minas Gerais. Aziz has been teaching law for eight years in Brazil and has been a visiting scholar at the University of Notre Dame (US) and at the University of Cambridge (UK). He has volunteered with Humanitas, a human rights NGO researching issues in human rights and international law. Brazil’s metropolitan areas, especially in low-income neighborhoods, are plagued by violence perpetrated by criminal gangs, abusive police and vigilantes. Torture by police and prison guards remains a serious problem and it is sometimes tolerated or even justified (by authorities and the population in general) as an effective means to fight crime. The number of public defenders is smaller than that of public prosecutors and those who cannot afford an attorney are subject to not being properly represented. Many violations of human rights are not even prosecuted because there are still many lawyers who do not know that they may file complaints alleging human rights violations. Additionally, in many of the overcrowded jails, there are prisoners who could be freed by filing a habeas corpus – a writ that, in several countries, including Brazil, can be submitted by anyone, even those who are not assisted by an attorney, their friends or relatives. Aziz educated the public on rule of law and individual rights in some of Brazil’s most challenging communities. He created different human rights related courses, which were designed to help understand the importance of the rule of law, create awareness of one’s rights and duties and also, aid in drafting legal documents, such as a habeas corpus. Those courses were made available on the internet and also on DVD’s that were distributed free of charge to community leaders, defendants and the police to strengthen the foundation of Brazil’s criminal justice system in low-income neighborhoods. The production of the videos included several interviews with professionals in the criminal system in order to collect information about the system. It should be highlighted Mr Sailiba and his team had to create different videos depending on the audience they wished to reach. In addition, detainees were provided with trainings on how they should properly use the habeas corpus procedure. Once produced, the DVD copies were also sent to Law Schools and prisoners in order to create awareness on the importance of the rule of law. Mr Saliba, in the implementation of his Project, found the support of different NGOs such as HUMANITAS, APAC and OMENS.